I had an arm injury in 2001 with the Detroit Tigers. I had surgery and had over a year of rehabilitation. In 2003, I re-injured throwing for the Boston Red Sox. I was told I would never throw again. Fast forward to 2006, I was messing around and threw some rocks from below shoulder level and it did not hurt. 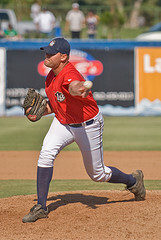 So I took the next year to learn how tor pitch from down below and signed with the Long Beach Armada (Independent) in 2007 and continued to pitch with them until they folded after the 2009 season. The biggest advantage to dropping down was the movement. I was a heavy sinker ball pitcher that threw primarily 90% sinkers from that arm slot. Every hitter knew what was coming but I was able to be successful due to its sink. The other advantage was my arm did not hurt anymore and I was pitching again. If I had not dropped down, I would not have been able to pitch again. I would say "pretend you are chucking a rock for your dinner for survival. How would you throw it with the best accuracy and most force behind it? Whatever slot that is, throw from it." (Jeff McKay, Head Baseball Coach Corban University). A side arm pitcher must let the arm work how it needs to work. It cannot be forced. RIghties: stayed away with sinkers and change-ups. Lefties: Stayed in on them and sliders away. Hearing opponents say 2 things: "I knew what was coming and still could not pick it up or hit it". "I would much rather face the closer (who threw 95mph straight over the top) than have to face you and your stuff".